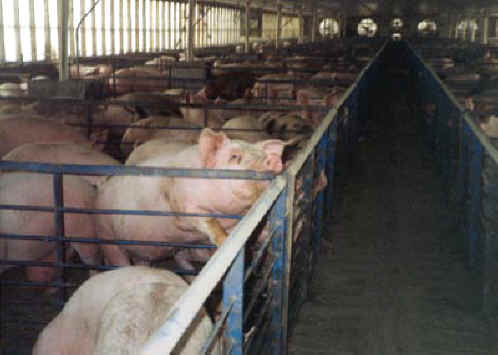 (Pig Exploitation - Factory Farming - 06) Pen after over-crowded pen of sensitive young pigs fill this factory farm building. Imagine the utter frustration that the pig who is chewing on the bar must be feeling. Just because some humans have the power to treat animals so inhumanely is no excuse for doing it and for causing so much pain and suffering.